First off I have to say I’m not an ultra lightweight camping fanatic, I just can’t enjoy the feel of plastic bags over traditional materials. 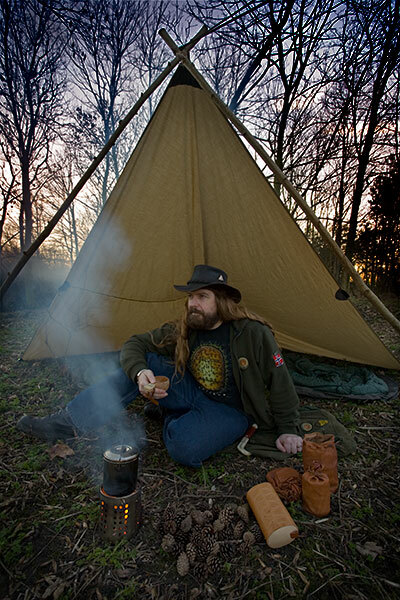 For information on super light camping you will have to go to the likes of Ray Jardine who is one of the experts in that field. I do cut the stuff I am carrying down to the essentials though, so that I can carry more camera equipment, and some of the tricks I’ve picked up could be useful if you are looking at reducing your own pack size. Firstly I look at the essentials, shelter, water and food. 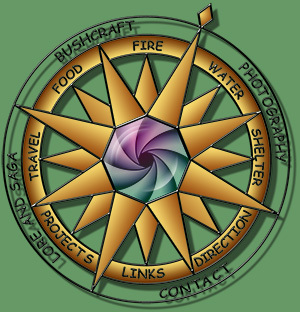 If you were to walk into a camping shop you would be amazed at the quantity of gear they sell for these simple requirements and if you were to buy everything the salesman recommended you would need a team of Sherpas to move it all. For shelter I usually use a tarp or more recently a Pyramid Tarp but if I’m travelling very light I can use a poncho which is pitched in much the same way but can also replace a waterproof jacket. 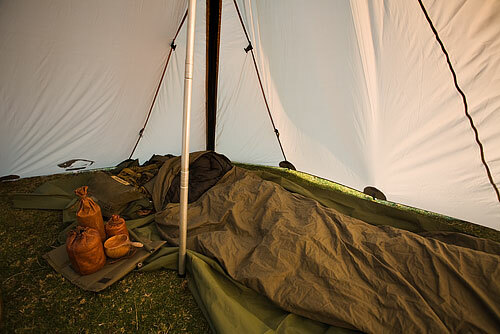 A waterproof, breathable “bivi” bag to cover the sleeping bag is a worthwhile addition, especially under a poncho which is smaller than most tarps. Some lightweight campers just use a light quilt, arguing that the insulation of a sleeping bag is compressed under the sleeper anyway. 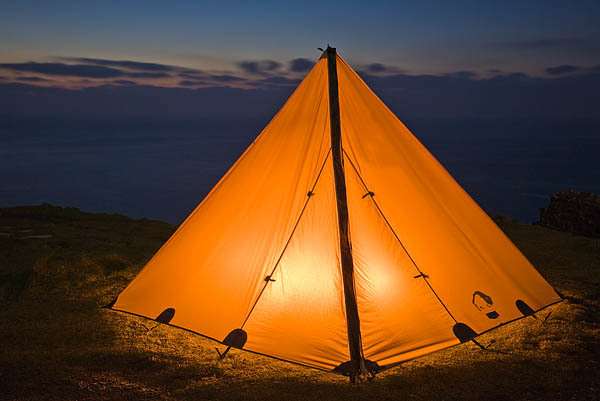 While this may have some merit and is certainly lighter, I find a good sleeping bag is more versatile and definitely much easier to use in a bivi bag. Because of that compression on the bottom of a sleeping bag it is essential to have some additional insulation under you while you sleep. In some places this can be natural insulation like bracken but in keeping with the minimum impact approach some kind of sleeping mat is a better solution. Air mats with foam cores have become popular in recent years but I still favour the old closed cell foam type of mat. They are usually lighter, can be cut to the size you require and do not spring a leak at the most inconvenient of moments. Wrapped around the inside of your bergen before packing, it takes up very little room and smoothes out the bag while also improving the water proofing and making it more comfortable. For water I usually carry one or two litres in stainless steel bottles which I find tougher than aluminium for almost the same weight. With most bottles the water is the heaviest part anyway but many people prefer plastic bottles and the thin type that fizzy pop is sold in would be my choice if I was going really light. When possible I collect water from streams or rainwater from my tarp depending on the situation. I carry a Millbank bag rolled up inside a couple of nested cups and chemical treatment for water purification if boiling water is not convenient. Add to this my Hobo style cooking set and my base equipment is packed, leaving plenty of room for my camera bag and tripod. Food will depend on location and length of trip but I often carry something like cous cous, quinoa or noodles as my basic rations with something to give it flavour. 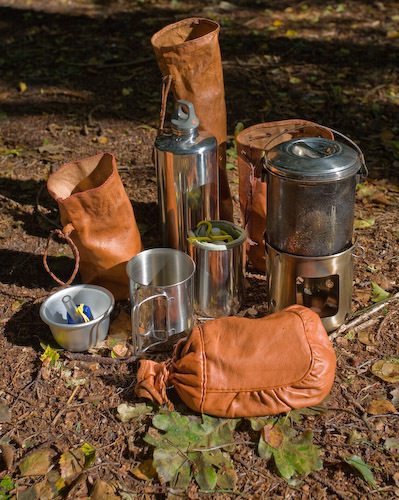 You will no doubt have your own favourite light rations.